Want to spend less money on any Lexmark toner? Getting your new Lexmark M410 toner cartridges with us allows you to help save a great deal of money and time. We have a lower price guarantee so that you only get excellent deals for Lexmark M410 toner so you won't have to go and shop on more costly high street shops It is Cartridge Save's intention to please every buyer by giving you fantastic prices as well as high quality Lexmark M410 toners cartridges that work reliably every time. Get Lower Prices Today For Lexmark M410 Toner Cartridges! If you have previously bought Lexmark toners with us previously you'll already know that the free delivery will cut your costs. This specific cost-effective Lexmark M410 toner can be paid for online simply by visiting our secure shopping checkout so don't lose out and make your purchase right now to save the most. However, you'll be able to purchase this discount priced Lexmark M410 toner by ringing through on our orders line. Customer satisfaction is Cartridge Save's biggest priority so we provide you with a guarantee on all Lexmark M410 toner cartridges to offer complete peace of mind. To get the ultimate offer for Lexmark M410 laser toner cartridges you simply can't get better than purchasing with Cartridge Save. For the small office, the Lexmark Optra M410 monochrome laser printer is a space-saving and efficient device that can perform low volume and basic document printing tasks without compromising the quality of output. The black and white Optra M-410 laser printer also offers ample print speeds to help users save time, but it is criticised for the lack of colour and the limited expandability options. With a rugged and understated design, the Lexmark Optra M410 printer can easily fit into any office environment. The small display screen and one-touch operational buttons in the control panel breaks the monotony of the design. There is a 100-sheet multipurpose feeder and a default 250-sheet input tray, and two output bins that can handle 20 or 250 sheets. 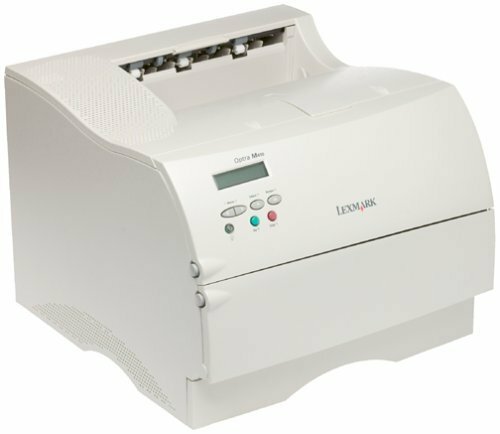 The Lexmark M410 is two times heavier than some of its predecessors, weighing almost 14.8Kg, but it is still compact, measuring 17.1 inches deep, 15.9 inches wide, and 12.4 inches tall. The standard ports include USB, an internal card slot, and a bidirectional parallel port. On-board operation and configuration is possible for the Lexmark Optra M410. The memory capacity can be expanded to 132MB, so print speeds won't be compromised when larger jobs are concerned. The Lexmark M410 Optra printer can achieve speeds of up to 12ppm on a wide variety of media including vinyl and dual web labels. With its capacity of 15,000 pages, the black Lexmark Optra M410 toner can increase productivity in an office environment. The M410 mono laser printer is only capable of printing in monochrome. Users need to buy optional network ports or local ports if they wish to connect the device into a network or through a serial adapter. The curved paper path of the Lexmark Optra M410 printer model may be prone to paper jam, which can be difficult to remove.